We’re heading to the farmers market this weekend with a truckload of mustard greens! We’re still a few weeks away from having a lot of variety to bring down to the market so the first few weeks will be very “green” heavy. With that being said, we hope folks love spring greens as much as we do! 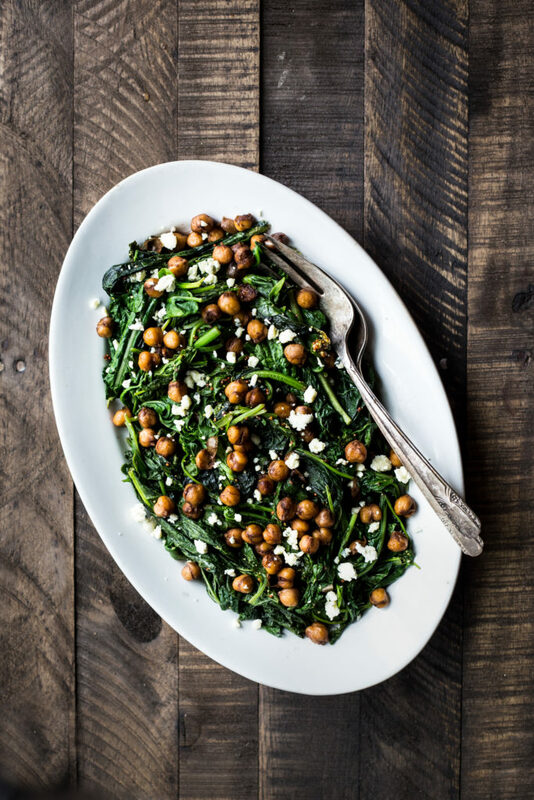 This recipe for wilted mustard greens and balsamic glazed chickpeas is a wonderful dish that celebrates one of my favorite seasonal greens. Spicy mustards pair really well with the sweet and tangy chickpeas and pungent blue cheese crumbles. I hope you all enjoy this simple side salad as much as we do. Prepare the chickpeas by heating the olive oil in a large dutch oven or pan (you’ll be using this pan for the mustard greens so make sure it’s large enough) over medium high heat. Add the chickpeas and cook, stirring often, until they begin to brown up a bit, about 3 minutes. Add the balsamic vinegar, honey and salt. Continue to cook until the chickpeas are coated in the balsamic/honey mixture and most of the liquid has evaporated, about 3 minutes longer. Spoon the chickpeas into a bowl and set aside. Heat the remaining 2 Tablespoons of olive oil in the same pan over medium heat. Add the garlic and cook for about 2 minutes. Stir in the mustard greens and a pinch of salt and pepper. Continue to cook until they begin to wilt and turn bright green, about 1 minute. Add the vegetable stock and bring the mixture to a simmer. Once simmering turn the heat to low and cook for about 2 minutes longer. Stir in the mustard and toss to coat. Using tongs or a slotted spoon place the wilted greens on a serving platter and top with the chickpeas and blue cheese crumbles.